When the All Saints announced they were getting back together to release their first new album in 10 years, the music world wasn’t really sure what to feel about it. After their split in 2001 over a jacket (yes really), the group reunited in 2006 for new single Rock Steady and new album Studio 1. Despite the pure pop magic of Rock Steady, Studio 1 flopped and the girls were going their separate ways again. It didn’t help that group member Melanie Blatt admitted that she’d only reunited with the group for the money. Studio 1 was an absolute mess and it was fair to think we’d never hear new material from the group again. What a different a decade makes! Despite the initial scepticism when the group announced their latest reunion – Will they deliver the goods? Will they be able to stop fighting long enough to make good music again? Will it be over as quick as it begun? – the signs were promising with the release of first single One Strike. The song may not have bothered the Top 40 but it is a reminder of All Saints at their best with their harmonies driving a growing melody. Lyrically the song is about Nicole Appleton’s split with Liam Gallagher, and it’s easily one of the group’s most personal songs to date. Red Flag sees All Saints embracing their pop roots and getting back to basics. There’s no attempt to keep up with the current trend of pop pickers here and the album is all the better for it. It may not be as immediate as their first two albums but Red Flag is quite the grower if you give it some time. The set opens with One Strike before making way for One Woman Man, a song that starts off very subtly but soon opens up with soaring harmonies and a feisty message. What’s clear from Red Flag is that for the most part it’s still the Shaznay Lewis and Melanie Blatt show. The Appleton sisters don’t appear to get a whole lot to do other than a handful of leads and harmony duties. That’s a real shame because one of the highlights on the record is Fear where Natalie really shines. Similarly she steals the show on the beautiful ballad Who Hurt Who. The Appletons proved they could hold their own on their debut record as a duo so I wish they’d been utilised more here. Elsewhere Ratchet Behaviour mixes reggae-tinged beats with vocal effects and is the only track on the record I’d class as skippable. 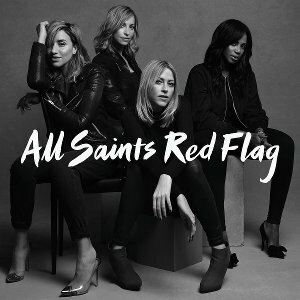 The moody Summer Rain showcases the All Saints trademark harmonies and is one of the best on the record, while the electro pop of Puppet on a String could easily be a hit for the group should they choose to release it as a single in the future. Make U Love Me has a dark and dirty groove that is as infectious as it is danceable. The album comes to a close with ballad Pieces, which stands out for its sparse production. You can really hear the vocals and it’s quite a bold way to end an album.